This is an old revision of this page, as edited by Addbot (talk | contribs) at 03:42, 13 March 2013 (Bot: Migrating 4 interwiki links, now provided by Wikidata on d:q198240). The present address (URL) is a permanent link to this revision, which may differ significantly from the current revision. Zhumadian (simplified Chinese: 驻马店; traditional Chinese: 駐馬店; pinyin: Zhùmǎdiàn; Postal map spelling: Chumatien) is a prefecture-level city in southern Henan province, People's Republic of China. It borders Xinyang to the south, Nanyang to the west, Pingdingshan to the northwest, Luohe to the north, Zhoukou to the northeast, and the province of Anhui to the east. Its population is 7,230,744 at the 2010 census whom 503,812 live in the built up area. 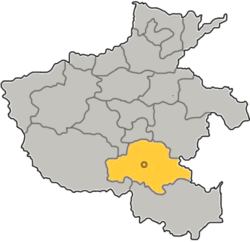 The prefecture-level city of Zhumadian administers 1 district and 9 counties. Zhumadian was previously known as Yicheng, for it used to be a relay station. In the Tang Dynasty, the emperor ordered his soldiers carry lychees from Guangdong to his charming princess Yang who loved to eat lychees. And Zhumadian was one of the relay stations. The terrain is dominated by mountains, hills, hillocks, and plains. Zhumadian has a four-season, monsoon-influenced humid subtropical climate (Köppen Cwa), with cold, somewhat damp, winters, and hot, humid summers. Monthly mean temperatures range from 1.3 °C (34.3 °F) in January to 27.2 °C (81.0 °F) in July, with an annual mean of 14.9 °C (58.8 °F). Sunshine amounts are moderate and precipitation is concentrated from June to September. Mainly wheat, maize, peanut, sesame, green beans and tobacco. Zhumadian has a rich cultural history and the birthplace of many great people in ancient times. There is an old site of Liang Shanbo and Zhu Yingtai who are the characters in the Butterfly Lovers, a famous Chinese story. Zhumadian has 62 different dams including Banqiao Dam within its territory. One of the Chinese main highways, China National Highway 107, runs through Zhumadian. Zhumadian also has its own transportation system.